Mike Lancaster captured this image of M35 on the 11th March 2014. It is a single 5 minute exposure taken with a Mallincam Universe camera at 10 dB gain through a TS 80mm f/6 triplet APO, with TSFLAT2 field flattener and an Astronomik CLS-CCD filter on an NEQ6 Pro mount. No guiding, flats or bias frames were used, although a dark frame was. Processing was done in Nebulosity 3, Elements 7, GradientXTerminator and Astronomy Tools. This image of M35 was captured by Chris Newsome on the 7th January 2008. 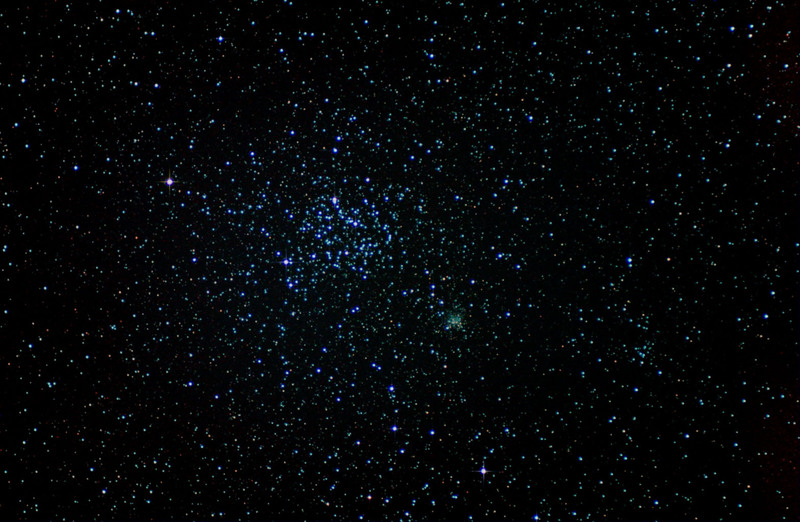 To the lower right of M35 is the magnitude 11 cluster NGC 2158, of similar size to M35 but at a much greater distance. It is due to parallax that it seems to be close to M35. In fact NGC 2158 is 16,000 light years distant! Chris used a Canon EOS300D (unmodified)/Baader MPCC/Astronomik CLS filter through a Skywatcher 102T on a Celestron ASGT mount. This was guided with a Meade DSI through a Skywatcher 80T using a GPUSB interface controlled by MaximDL. Exposures & Processing:- 10x240sec at 800ASA. Darks and Bias calibrated in Maxim DL and processed in CS2. This image made Picture of the Week in the third week in January 2008 on the British Astronomical Association website. 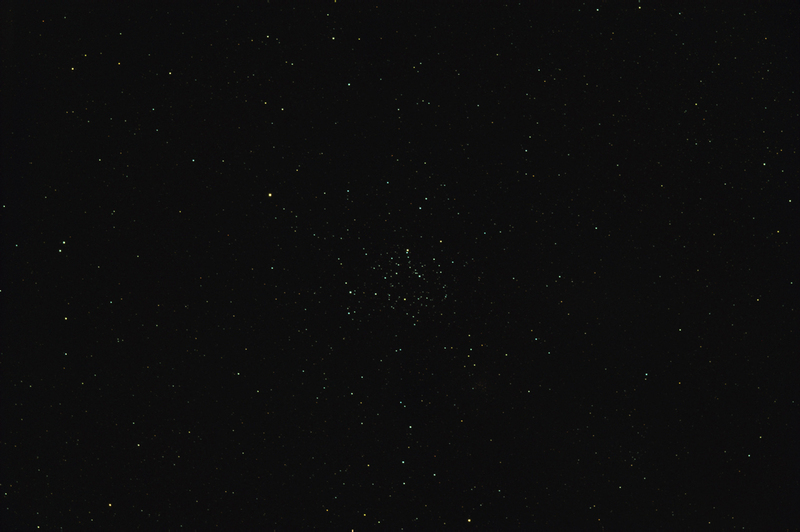 Chris Newsome took this image of the open cluster M35 on the 11th November 2005. 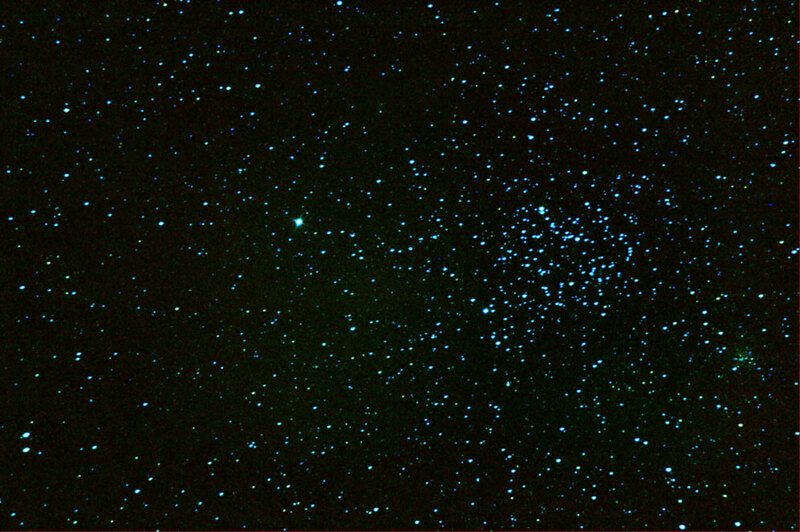 The open cluster NGC 2158 is also visible to the lower right of M35. He used a Canon EOS 300D camera at the prime focus of a Celestron C6-N. Three 30 second exposure images were stacked and dark subtracted in K3CCDTools and then processed in Photoshop v7 using Gradient XTerminator (to remove the sodium streetlight glow) and Curves and RGB Levels.